Previously, on MinerBumping... JTClone Ares spent months recruiting carebears into his rebel alliance, The Clone Republic. He didn't know how to strike against the New Order, so he just kept on recruiting. 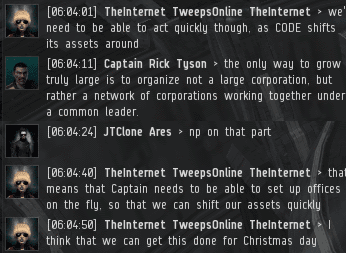 But then, two days before Christmas, he was contacted by TheInternet TweepsOnline TheInternet and Captain Rick Tyson. They claimed to have a high-level spy in CODEdot, and they needed JTClone's help in bringing the New Order down. Although initially concerned that he might be walking into a trap, JTClone couldn't resist joining the conspiracy. Especially since it mostly involved "someone else" doing something to stop the New Order. TheInternet started to unveil the details of the plot. It involved a major heist of New Order assets. Captain Rick added that there were actually multiple spies in the New Order who would assist with the plan. At least one of them, according to TheInternet, had a "golden ticket": Full access to New Order Logistics, the largest corp in CODEdot. For the last two and a half years, the New Order has been completely victorious, winning battle after battle. But Rick believed that a spectacular heist would change the momentum of the war. Finally, the rebellion might have a chance. JTClone nodded along agreeably. To fully exploit the positive effects of the heist, the resistance would need a single leader. JTClone immediately saw himself in that role. The conspirators grew increasingly excited. 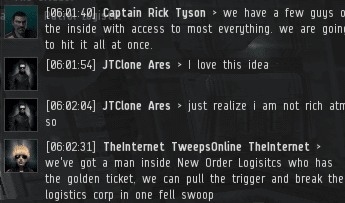 Visions of stolen CODEdot loot danced in their heads. They could already taste the rebel victory which had so long been denied them. 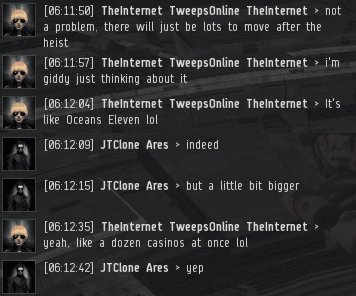 Because the New Order has its assets stored all throughout highsec, the heist would need to be perfectly timed and coordinated. The slightest mistake could result in failure. JTClone was all-in. Now he only needed to know when to be online so he could take part in the heist. His job would be to ensure that all the stolen assets got transferred to offices under the control of his alliance, The Clone Republic. Unfortunately, this would need to be an "alarm clock op", well outside of JTClone's preferred time zone. No matter. A little sleep deprivation was a small price to pay for one hundred stolen Catalysts. Actually, the New Order has far more than a hundred gank ships in its possession. It goes through a massive amount of hardware each week. 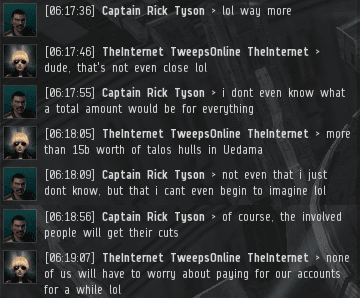 Captain Rick and TheInternet estimated more than 15 billion isk of ships in Uedama alone. The total heist would net the conspirators tens of billions. With that much isk, they would all be swimming in PLEX! Upon learning the full scope of the plan, JTClone could barely contain himself. He once again affirmed his willingness to participate in the conspiracy. There was no mistaking it now: JTClone Ares was a rebel carebear. The conversation was clear evidence of his intent to commit treason against the rightful rulers of highsec. If the dastardly plot succeeded, it could very well mean the end of the New Order. There's one thing I always wanted to ask those "rebel leaders", "code's nemeses" etc. Do you guys realize how pathetically incompetent you all are? I understand it's all game and good spirits and all, having fun is the thing, but dude, really? Not single one of these guys can show anything besides major losses in KB. If you're playing an anti-code fighter, at least do something! Jennifer, for example, was pretty effective at some point, using all those "cheating" schemes Veers was so appalled to hear about. No worries, it's the result that matters. But again, she never boasts, she just does the thing. But those guys... Can't believe they are saying what they're saying and believe it themselves. If you were banned in AG before, you aren't now. Go there and say what you need to. At least in my time back when I was a player, it was also the place to issue threats of real life violence and express endless tears over valid game mechanics, don't forget that. Oh & this made me lol a lot! - "To a carebear, "tanked to high heaven" means the ship has at least a small shield extender to go with its cargo expanders." Sorry to spoil this thing for you guys, but there's only one way this can turn out. Oh, right, every time. carry on. My level of suspense is to high heaven! I bought the whole seat, but I only need the edge! 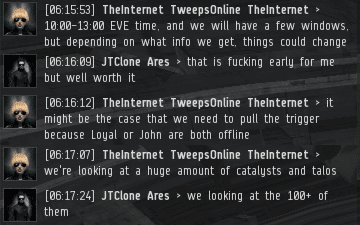 Once again words fail me... is there not a minimum age restriction to EVE Online? Cause these guys seem like they are in their early teens. Maybe there should be a IQ test before your allowed to have an account. Just saying. True, but is it not the end result for CODE anyway? The glorious future? The dream? Is this gonna a new catch-phrase from now on? "That hulk is tanked to high heaven." "Okay, let's fit meta 0." Civilian modules will do fine. Did JTClone Ares manage to destroy the CODE once and for all? 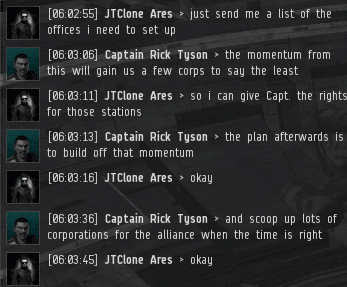 Is PV Rock a photoshopped Captain Rick Tyson in game, or is it the other way around? Will the rebel alliance "The Clone Republic" gain enough momentum to turn the tides of the war? The answers to these important questions and more will be coming soon in the stunning conclusion to "Ocean's Zero"! Anon 3:15: no fake. Google "jtclone ares", search pastebin for him, check his recent losses on zkb. He must be an alt of veers; his idiocy is quite incredible. 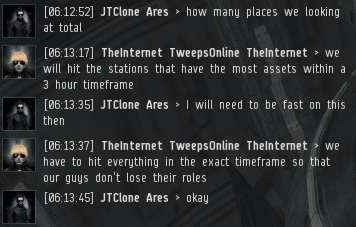 I saw JTClone talking in AG channel more than a few times. The content here is no fake at all. if anything, JTClone does not show his whole potential in those chats.